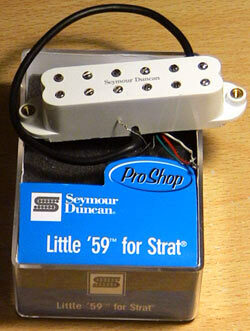 I bought one of these for the bridge position in my Tokai Goldstar Strat ’57 replica. I never used the bridge pickup on it’s own on this strat because I always thought it was too weedy. However when practising with the band at high volume sometimes I’d switch to it to cut through the mix a bit more, there was plenty of bass supplied by the… bass and the drums! Anyway after trying a Les Paul and a PRS where I favoured using the bridge pickups I thought one of these Seymour Duncan Little ’59 mini humbuckers would add the magic ingredient to this Strat! I’ve never bought a big name pickup before, never thought I needed to. But getting another useful sound out of the Strat to have heavy rock available at a flick of the switch to the bridge pickup was too tempting! The pickup arrived and it was easy to fit – following the instructions. The Little ’59 humbucker is splittable into a single coil, but if you don’t have the electronics in place you can just wire it up as a straight ahead humbucker (or as a single coil, but that would be pointless?!?). I’d got it for humbucking, so that’s how it was wired, with no switching options required (or available). Before this pickup arrived I’d recently been in possession of a Mexican Fender Strat with a single humbucker retro-fitted (Gold covered, from a Tokai Japanese Custom Les Paul), also I’d had a PRS Santana, so I knew what kind of sound I was expecting from this Little ’59. Yes, I thought I could get the great Strat neck and out of phase sounds and a big fat humbucking bridge sound for rock/distortion. You might have a clue by now that this Seymour Duncan Little ’59 mini humbucker was a bit of a disappointment… It did buck the hum, yes, it worked pretty well in that it was still a nice usable sound combined with the middle pickup in a kind of out-of-phase sound. But as a humbucker it sounded kind of ‘mini’, which it is. Since then I’ve read about humbuckers needing more space or air for the magnetic field etc etc etc. So it did work, the bridge pickup gave more output, no single-coil humming and helped the amp overdrive a bit more. I didn’t want to carve up my Tokai Goldstar to fit in a full sized humbucker at the bridge, so this was a compromise that worked. I had this pickup for about 6 months and it’s now been sold off to a new owner. It kept it’s value pretty good anyway, I got almost as much as I paid for it. Now I have a Fender Stratocaster HSS Mexican, with the stock factory pickups. The humbucker in this guitar is quite a lot more big and overall better sounding than the Little ’59 mini humbucker. That’s another story though, so many people complain about these Mexican Strat pickups but I think they’re fine. The Tokai Goldstar has vintage alnicos and the Mexican has 2 ceramic single coils to accompany the humbucker. I notice these ceramic single coils have more power and more bite, which is nice as they balance with the humbucker well so I’m very happy not to change anything there. Seymour hit the nail on the head with this design. I’m lucky, to have several guitars fitted with these little 59’s. He also has a JB model of this size. Along with Larry DiMarzio, Duncan will go down as a pioneer of the after market pick-up industry. No offense SD,but I’d wish you would leave the name off of the tops of your pick-ups as we all know who you are! I like the Duncan JBjr, probably because I like the JB (senior?) in the rear of my Les Paul. The splitting is an added bonus to get the original single coil tone and quack when combined with the middle pickup. You can even wire it this way with most standard 5-way switches to be single coil when use with the middle and bucker when used on its own. Or you can wire it to an external switch or push-pull pot. Haven’t found a rear pickup I like better in a Strat. It definitely has more balls than the 59. You can hear samples at Duncan’s website, which may help you to determine if it’s for you or not. Good luck and thanks for the review. Thanks for the info Lefty. Currently I am happy with my 2 Strats, one an original config ’57 replica with the lowish output single coils, the other a HSS Mexican Strat from 2009 with ceramic single coils twinned with the humbucker. Sounds like when I chose the Little ’59 I was looking for the JBjr. Sorry to hear you were disappointed with the Little ’59. I dropped that in a few Strats that I was too lazy to just replace the pickguard cut for humbuckers. I was more than pleased with it. Gave more output and warmth than a standard bridge single coil, and balanced overall with the other two single coils. And a standard ’59 HB won’t be that much louder. The classic HB’s didn’t read much more than about 8k ohms. For a classic rock tone, they are great, but if you are playing more aggressive music, most people seem to gravitate towards the JB, which is great for what it does. Being raised on classic rock, I’ve gone back to the ’59 and/or the Alnico II Pro for humbuckers, and I recently switched to the Duncan Texas Antiquity Hot for Strat single coils. I’ve the most happy with my tone than I’ve ever been. I tried a lot of high output pickups, and they seem to color the tone and have a magnetic string pull. The classic output replacements seem to let the guitar’s natural personality ring through, for my taste. So fun experimenting. Hi Mike, I think I had an Alnico II humbucker (Japanese Tokai Love Rock bridge pickup) in a Mexican Strat previously and liked it a lot. I liked it a lot more than my Little ’59. I think I liked all the real humbuckers I’ve used more than that actually. 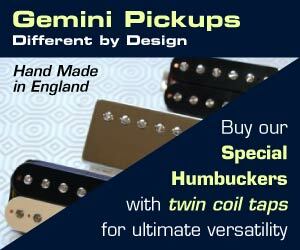 The regular humbuckers, for me, are just thicker sounding, probably to do with their size and the wire thickness that can be utilised in the more roomy format. Mike at Gemini pickups told me the precise technical reasons why I felt this way, but I’ve forgotten what he said now! Thanks for your comments.